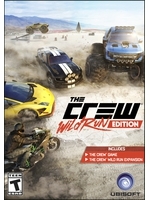 The latest update for The Crew: Wild Run brings a mode: Stunt Races. It allows you to perform tricks and stunts with your bikes on specialized tracks. More details and trailer inside. SAN FRANCISCO — April 20, 2016 — Today, Ubisoft® announced that a new mode, Stunt Races, is now available in the latest update for The Crew® Wild Run. Starting today, players will be challenged to perform tricks and stunts with their bikes on specialized tracks. Time and skill will be needed to reach the highest score. For more information about The Crew, please visit thecrewgame.com. It must be doing well for all the support this title gets but then again so did Driveclub, either way it's very commendable. I would have played this game but it look so 'generic' a word I try to to stay clear off when describing a Ubisoft game as it seems synonymous in a cliched way, but it is true there games often have a underwhelming first impression.